I stayed up a bit late last night, so I was tardy for the royal wedding. Thankful for DVR and Diane Sawyer, I tuned in exactly as the queen arrived at Westminster Abbey. Glorious in sunny yellow! I do wonder, though. Why does the queen carry a purse? I doubt she'd be stopping for a cup of carry-out tea. The ladies' hats were out in full regalia! Some, like Camilla's, had elegantly lovely lines. Others, like Princess Beatrice (on the right in this photo, with sister Eugenie), comically resembled reindeer antlers. How did this girl keep a straight face? And Victoria Beckham's maternity outfit: excessvely formless. You'd think she could smile on such a happy occasion! The procession. The hats. Kate's dress. Pippa's dress. The balcony kiss(es). The groom's military dress attire. All fabulous and fascinating. "They included pressed duck terrine with fruit chutney, roulade of goat's cheese with caramelised walnuts, quails eggs with celery salt, bubble and squeak with confit shoulder of lamb, grain mustard and honey-glazed chipolatas and miniature Yorkshire pudding with roast fillet of beef and horseradish mousse." Bubble and squeak? Oh, yum. OK, my mom used to make Yorkshire pudding. Love that. Then there's the cake. 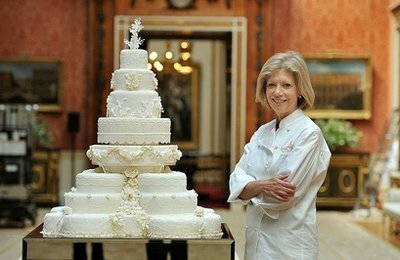 A gal the very same age as me was the royal cake-baker. Wow. Can you even imagine? Good job, Fiona. Looks like you hit a home run. Though I don't know you, nor you me ... I am proud of you, Fiona. Proud that you, a 56-year-old sister, baked the cake of the century. Not a 25 nor 38-year-old, but a 56-year-old. And your cake looks stupendously beautiful and delicious. Thank you, Britain, for a day of pageantry. Thank you, William and Kate. what's your wedding guest name? In honor of the royal wedding on Friday, use your royal wedding guest name. Start with either Lord or Lady. Your first name is one of your grandparents' names. Your surname is the name of your first pet, double-barreled with the name of the street you grew up on. Post yours here. Then cut and paste it into your status. Hilarious! Come on readers ... follow the directions and tell me what your royal wedding guest name would be! Alright, I admit it. I'm a little excited about the royal wedding in two days: Prince William marries Kate Middleton in Westminster Abbey. If I want to see the live broadcast, I'll be sipping coffee by 5:00 a.m. on Friday. I remember the wedding in 1981 of William's parents, Charles and Diana. I got up in the middle of the night, not having the advantage of DVR. Theirs was the first royal wedding I ever watched and it was magnificent. Diana's train was 25 feet long. Wow. Of course, their marriage didn't last: the victim, perhaps, of a too-public and unrealistic lifestyle. 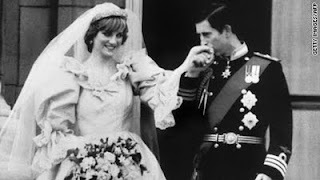 Is it true Charles and Diana were together only 13 times before they married? She seemed sad from the start, the 19-year-old bride thrust into such a public life. I hope Kate and William forge a committed, happy and lasting union. though not all my "chicks" were here. but still I miss them. daughter-in-love Jill. A lovely day. Mark showed his awesome turkey-carving skills to his dad. Cooking is fun, fun, FUN! And the girls are just cute as ever. Katie and I put together the table decor ... how do you like it? And finally, the clean-up crew. we enjoyed Katie's masterful chocolate silk pie. Oh, my. with family and good food. And with thankfulness for the risen Savior. I am a sinner and can't get to heaven on my own. God paid the price for my sins: dying by crucifixion. He rose from death, as promised, three days later. By taking on my sin, Christ has redeemed me for eternity. He loves me - and you - like crazy! for the sun stopped shining. When he had said this, he breathed his last. 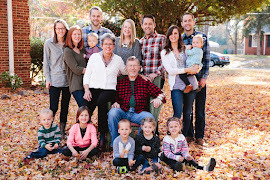 and [my daughter-in-love] Jenny's parents, sisters & husbands, and little ones. for 17 people, including 3 children. No eyes closed, no hidden heads! Happy birthday - again - Ari. But then, I wished you a special first birthday already. Do you have trash pickers in your neighborhood? People who find goodies up and down the street on trash day? Well last evening I became a pine needle picker. On a quick walk around the block with Ellie, I spied an entire trash bin of gorgeous pine needles, awaiting pick up tomorrow. Yard waste! I took Ellie home, got our rolling trash can from the garage, and headed back. I don't know these people well, so it was a little weird to knock on their door. The Mister happened to be at the kitchen window, shirtless, and I motioned to him, "may I have these?" He opened the window and said - what else - "sure!" He must think I'm crazy. Home I went, happy as a clam (are clams really this happy?) with my load of pine needles. I spread them out back along Ellie's "trail" and they look dandy. They should help the mud issue. Ya know, some of the best things in life certainly are free. My county is a paradox. It holds the superlative as one of the fastest growing counties in the state and, at one time, the entire country. I live near the center of the county. The booming growth lies to the south of us, but to the north you will find stunningly peaceful, quietly beautiful, rich farmland. Trains daily blow their whistles as they journey through Delaware County. Tidy family farms dot the landscape and I never tire of a drive through this gentle countryside. It speaks strongly and lovingly of the generations who have worked the land to produce corn and soybeans. I love my county! I came across this five year old photo last night. 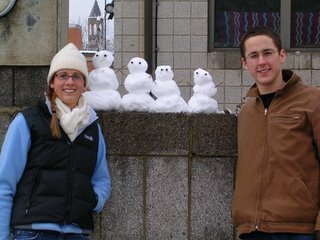 Dan and Jenny were dating and juniors in college. 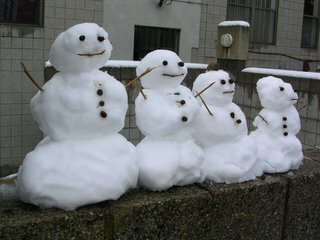 just like their little snowman family. And then I shall have two darling granddaughters! I'm not sure why my little brother put up with me. 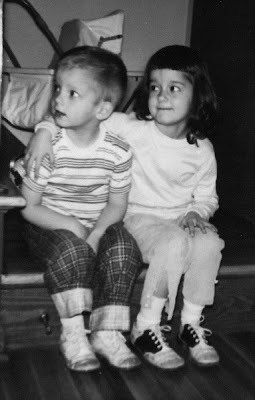 But we had fun as pre-schoolers; at least I did because he followed all my orders! Happy birthday to a great guy: my brother Mark! Once in awhile, hubby and I sneak away to catch a matinee, which we did this week. Movie choice: Soul Surfer - the true story of Bethany Hamilton, the 13-year-old in Hawaii who lost an arm to a hungry shark. Love, loved it. Take your spouse, kids or just yourself and go see it! Well obviously, matinee showings aren't filled ... so when we were the first to take our seats ten minutes early, we figured only a few more would trickle in. Concession ads. Still no one else. The movie begins and Bill whispers, "we might really be the only ones here!" "Why are you whispering?" I whisper back. So no other mid-week, mid-day movie-goers ever came. There we sat, with our choice of 300 seats, all alone with a huge tub of popcorn. Weird but fun. While on the topic of reading, I pulled out an essay that won a contest I entered six years ago. The contest topic, "How Books Influenced My Life," came from an online writers' forum. Word maximum was a short 250 words. So I wrote up this little essay and emailed it. And won. I believe there were only a handful of entries. But the prize was a critique by Carol Rottman and a copy of her writers' devotional, Writers in the Spirit which I totally love. It was neat to correspond with Carol, and I still occasionally keep in touch with her. A 45-year-old black and white snapshot reveals my lanky young mother, my pajama-clad brothers and me nestled on a bed, tethered together by an open picture book. My mother’s Tennessee drawl eased me gently away on nightly adventures with Pooh and Piglet in Winnie-the-Pooh and Mole and Ratty in Wind in the Willows. Their magic, like my mother’s southern meals, was poured into me and grew an appetite for words, a love of stories, and a craving for more and more books. 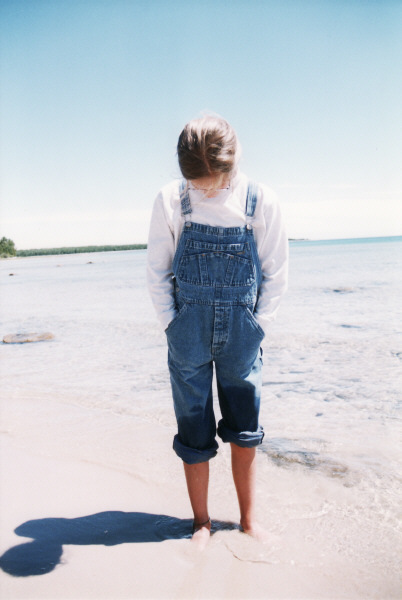 Books and bedtime, books and blankets, books and the beach all wove a tapestry of my earliest, fondest memories. 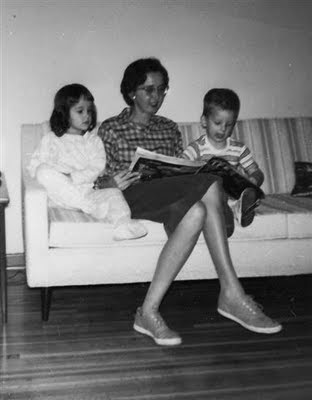 Like a close childhood friend, my time with books has ebbed and flowed over the years. Babies, child-rearing and housekeeping reduced my personal reading time substantially. I was, however, honored to expose my four children to the wonder of reading as we hauled in stacks of library books on snowy winter afternoons. These days, books continue as my faithful companions, whether crammed in a tote bag on summer vacation or balanced precariously on my bedside table. My childhood friend is back, to pick up where we left off before life became so full. One of the greatest gifts from my husband came right after we started dating. He encouraged me to start a reading log. And so, in the summer of 1975, I began logging my reading in a green spiral notebook. In it I recorded the title, author, date completed and a brief opinion of the book. I'm always fascinated to look back through my log. Books on adoption when we were considering that. Books on sibling rivalry when my chickies were terrorizing each other. Books on faith before I even came to faith. Pretty much no rhyme, reason, or plan. I'm a spontaneous reader, I guess. Two years were book-less: 1984 and 1986. Career changes, two babies and two moves were going on. I was doing good to keep us all fed. If you're into stats, my highest average was ten books a year, and in the last ten years my annual reading average nearly doubled. How many books did I read? Officially: 164. Add in Bible studies and scores of magazine articles and it might be 200. I don't think it's nearly enough: think of all the great ones I've missed! When the 50th anniversary of To Kill a Mockingbird rolled around, I decided to read it. Only to discover, looking back over my log, that I'd read it 25 years earlier! Uh, and it did seem awfully familiar after a chapter or two. It may seem like a pointless pursuit to you. But I treasure my log book and I challenge myself to read more each year. And maybe someday my granddaughter will find Baba's reading log and get a sense of my love of reading. and﻿ it's about to swallow me. Years and years of photographs. The time has come to get them in order. I have a feeling this will be quite a journey. I recently read The Gift of an Ordinary Day by Katrina Kenison. An editor for nearly two decades, Kenison is a gifted writer. I admire her skill at crafting words and in Gift she captures a mother's heart as she enters the season of releasing her children into young adulthood. She describes parenting two very different children, a new season in her marriage, and the unsettled desire to start fresh by relocating and building a new house: themes which resonate with me. Faced with losing her job and unexpected time on her hands in their new home, Kenison grapples with what comes next at mid-life. She writes, "I am ready to sit, to listen, to allow some long dormant part of myself a slow, quiet awakening, an unfurling into new life." I loved crawling into bed each night to read Kenison's steady prose, and I identify with the rich and raw emotions of a mother nearing the finish line of child-rearing. On the surface it's a beautiful book. But. For all the 300 pages of outstanding writing, for me this book is disappointingly secular in ways I couldn't ignore. In nearly every corner of her book, Kenison dances close to acknowledging the need for God in the questions of life, but never quite gets there. When Kenison's father-in-law dies and her son questions her about life after death, Kenison evades an answer and points to a full moon as a message from God. From death to gardening to her sons' growing independence, Kenison looks to nature, other people, and herself for comfort. There was a time when this was my practice, too, but eventually it rang terribly hollow. Like Kenison, I've found that life's not easy, especially when the inevitable challenges and changes come along. My husband doesn't always understand or love me as I need. Kids push me to the edge. They demand, disobey or disappoint in the face of my unwavering love. My mothering must constantly evolve as my children grow. In the end, no one can really, fully make me happy. That sums up the simple reason I'm thankful to have a reliable constant in my life: a God who made me, knows me, guides me, loves me more than anyone, cares about every detail of my life, and is the source of true, lasting contentment. And who can handle all my questions ... about life, love, defiant kids, and what to do when I'm just cranky with life. Come to think of it, you might say that God is the gift in my ordinary days. Just back from a walk with my friend Lisa. On weekends when it's not icy/snowy/horrible weather we try to take a longer walk beyond my neighborhood. So Ellie and I started out to meet Lisa part-way. In the upper 30's, windy and cloudy: not bad by winter's standards. Just at the point where Lisa and I part paths for home, something started falling: white, frozen stuff. Small, about the size of a pencil eraser. In fact, it looked much like Dippin' Dots! Bouncing off the sidewalk, my head and Ellie. She seemed a little confused. The Dippin' Dots only lasted a few minutes, but I felt kind of silly, like a kid caught in a rainstorm. Gee, when spring finally gets here it's going to be boring!